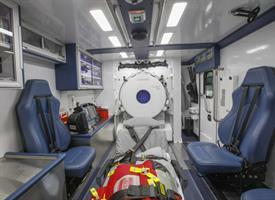 ROCHESTER, N.Y. -- Next month, UR Medicine will begin operation of a Mobile Stroke Unit (MSU), a high-tech ‘emergency room on wheels’ that is designed to provide life-saving care to stroke victims. The $1 million unit will be operated in partnership with AMR as a community resource and represents a significant step forward for stroke care in the Rochester region. The unit is owned by UR Medicine and will be operated by AMR. The MSU will be staffed by a UR Medicine nurse trained in stroke care and a CT technologist, an AMR paramedic and emergency medical technician, and remotely by a stroke specialist at UR Medicine. The unit will be dispatched by the City of Rochester and Monroe County Emergency Communications Departments. For the first three months, the MSU will operate exclusively in the City of Rochester. After this initial pilot period, the service will expand to the rest of the Monroe and Livingston County EMS region and UR Medicine and AMR are exploring ways to extend the availability of the service to neighboring counties over time. Patients being treated by the MSU will be taken to the nearest hospital with the appropriate level of care to treat their stroke or the hospital requested by the patient. "The Mobile Stroke Unit is an amazing new tool for our 911 operators to use when a call comes in for a possible stroke," said Rochester Mayor Lovely Warren. "The precious seconds saved between diagnosis and treatment will translate into lives being saved and families remaining whole. 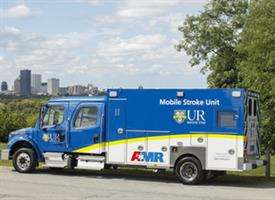 I would like to than thank the University of Rochester, AMR, our team at 911, and all of the generous donors for their partnership and continued investment in our community." The UR Medicine MSU is the only unit of its kind in upstate New York. The first MSU was launched in the U.S. in Houston in 2014. Since then, units have been deployed in several other cities, the closest being Cleveland and New York City.